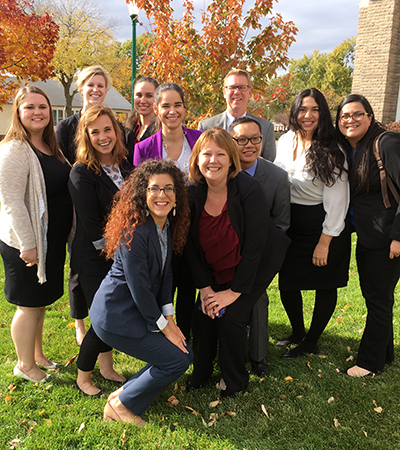 On Saturday, October 21, nine law students, accompanied by Professor Kevin Ruser, provided immigration advice to clients at St. Mary’s Cathedral in Grand Island at a “mobile consular clinic” sponsored by the Mexican Consulate in Omaha. Omaha Consulate staff periodically travels to various locations throughout Nebraska and Iowa to provide consular services to its constituents. The types of services provided include producing Mexican passports, national identification cards, and other types of documents required by Mexican citizens. The Consulate has also asked other organizations to be on hand at these events to answer any immigration questions that attendees might have. Various organizations were on hand to address immigration-related issues on Saturday, including the Center for Legal Immigration Assistance, Catholic Charities, and Nebraska Appleseed. This is the first time Nebraska law students have participated in this event. During the day, the students, under Professor Ruser’s supervision, met with various clients on a limited scope basis to provide on-the-spot counseling and advice relating to immigration questions presented by the clients. The students also assisted various clients in executing temporary delegation of parental powers documents. In preparation for this events, the students attended a three-hour training with Professor Ruser that dealt with the types of immigration issues they were likely to encounter at the clinic. The nine students who participated in this “walk-in” immigration clinic include the three students currently enrolled in the Immigration Clinic: Morgan Nelson, Miranda Rogers, and Phong Tran. The other students who attended the event were Sydney Aase, Paloma Contreras, Shailana Dunn-Wall, Nicole Iraola, Megan Meyerson, and Deanna Pina. The were ably assisted by Sydnee Schuyler, administrative assistant for the Children’s Justice Clinic and Civil Clinic.